"This has become our favorite fish recipe. Besides being very tasty, it is a quick and easy recipe. We use black cod (US name) or sablefish. Pollock can be used. A while ago I found a similar recipe in a grocery store; it was good but need some tweaking. Basically I toned down the tomato topping, increased the Parmesan, decreased the mustard sauce and modified the cook time. In our opinion these changes made a better balance of flavors. Despite the four serving count, we found that one pound of black cod is just about the right amount for the two of us. Serve with Pinot Gris and French bread." Combine tomatoes, basil, olive oil, Pinot Gris, onion, garlic, salt, and black pepper together in a bowl; refrigerate until flavors blend, about 30 minutes. Place black cod, skin-side down, on the prepared baking sheet. Mix Dijon mustard and butter together in a small bowl. Bake in the preheated oven for 5 minutes. Flip fish and brush mustard-butter over fish, coating the surface completely. Continue baking fish until it flakes easily with a fork, 5 to 6 minutes. Cut fish into 4 pieces. Spread arugula onto serving plates. 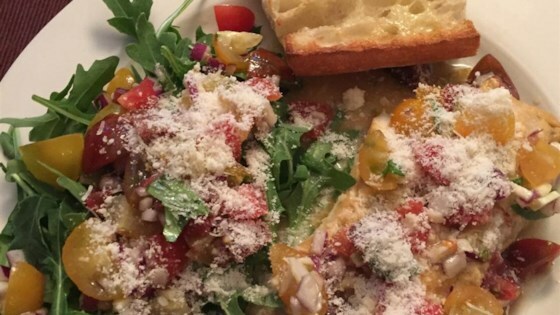 Arrange fish onto the arugula and top with tomato mixture and Parmesan cheese. We found that we do not use all the tomato topping, so we use the leftover topping as a simple, but good salad dressing.